A superb storyteller, Hermann shares his personal insights about the natural history of the area. His paintings embody the revelations of his studies, his attitudes, and his craftsmanship. Every painting takes months of painstaking research. He reproduces the tools and objects in his art to understand how they work. He and is wife, Elizabeth Neily have traveled to Guatemala, Panama, and Canada to visit, historical, archaeological and paleontological sites, and to study native cultures. And their travels have taken them all over the United States. Born of German parents in Rochester, NY, Hermann relocated with them to St. Petersburg, FL in 1st grade. As a boy, he played along the sandy shores of Tampa Bay, collected arrow points in the playground at Roser Park Elementary, and tumbled along the paths of ancient Indian mounds. A self-taught artist, Hermann spent a year traveling in Europe, stopping to study at for several months at the Hous de Kunst in Germany. Family in Germany begged him to remain there, to become heir to their family fortune, to replace their sons lost in World War II, but he decided not to take them up on their generous offer. Upon returning to the United States, Hermann was troubled by the fact that growing up he had learned to be a good German, yet he was not truly American. 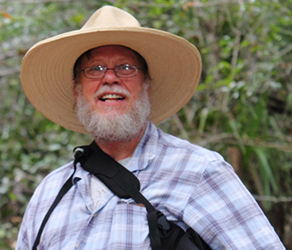 He began to explore the natural and cultural history of Florida and spent over 25 years as an interpretive park ranger at Boyd Hill Nature Park in St. Petersburg. As the result of this experience, he learned to understand how eco-systems work and how humans survived for thousands of years in the complex environs of Florida. As a young man discovering his place in the world, Hermann fished for mullet, Spanish mackerel, and stone crab in Tampa Bay. He worked for Pinellas Seafood, along side men and women who lived rough-scrabble lives. He saw sharks hitting the nets as they were drawn aboard the fishing boats. He mended torn nets and laid them out to dry. He laughed with the women as they filleted fish together for the market. Brought up in the Deep South, Hermann was indoctrinated in the hatred that permeated white culture at the time. Through personal reflection and studying world cultures, he came to understand that people are just people, and put aside all the wrong lessons he had been taught in 'Jim Crow Florida.' Not only does he have a deep love for Native American culture, he embraced Florida's African American history as well. In 2003, he organized an exhibit and living history program, 'A Treasured Legacy, 1745 - 1845' which explored freedman towns in Florida.